The Primary Grades (Lower School) at Presentation are child-centered and developmentally appropriate. It is in these grades that we lay down the foundation for the student’s future school life. Our teachers carefully guide the K - 4th grade child, instilling in them a love of learning, confidence in their own voice and respect for others. We value a young child’s natural desire to learn through exploration, creation, and self-expression. We want our children see themselves as part of the world, dream big, and then equip them for success! Beginning in Kindergarten students learn what it means to be a Presentation student, which to us means students who embody the ability to Love, Learn, and Lead. Even the youngest child can see their calling to love others, learn about the world around them, and how they can be a leader today and for the future! Helping children develop their natural strengths and build skills means honoring the whole child. Beyond rigorous academics, our lower school children spend significant portions of the day immersed in Spanish, art, music, drama, and PE. Our Language Arts program provides the building blocks for students that allow them to explore and develop language arts skills and concepts. Enveloping the children in a literacy-rich environment, our comprehensive language arts program lays the foundation for literary growth and self-expression, and continues on with them through their subsequent years at Presentation. The years spent in Lower School are marked by incredible growth. These are critical years when a child moves from learning to read, to reading to learn. Focus moves from phonics in K-2 to literary analysis in 3rd and 4th. The program is supported by 6 + 1 Writing Traits. Students develop not only the art of verbal storytelling, but also the skills to put pen to paper, to share their thoughts, opinions, and to clearly demonstrate their learning in a written format. In addition to aligned curriculum, a similarly aligned philosophy and approach to mathematics ensures all Presentation School students receive consistent quality math instruction. We are always striving to ensure that all students are properly supported and challenged. That means being able to meet diverse capacities within the classroom. Our teachers attend the Making Math Real Institute. Making Math Real (MMR), providing best practices and multisensory structured approaches to teaching math K-12. Teachers know how to link the three processing modalities (visual, auditory, and kinesthetic) at the same time, and how to aid students in moving from the hands-on experience of concrete math to It is specific reconstruction in abstract, symbolic forms. Our goal is to create mathematical thinkers who understand how numbers work, and how to apply that understanding throughout their lives. Mathematics is taken beyond the basics to open the world of numbers, math logic and number sense to the young mind. A hands-on approach is emphasized, as are mental math activities and conceptual projects. Students build a strong foundation for solving complex mathematical problems, while tackling the necessary simple memorization of number facts and operations. The Lower School math program guides the students from basic facts and number families, to place value and equations. Once fluent in all things numbers, up to three digits with regrouping, student are introduced to larger composite numbers and a formal introduction to multiplication and division. The rising 4th grade student has further tackled division, fractions, and an introduction to geometry. Science and Social Studies are critical pathways for students to make connections between one’s self, community, and the natural world. Social Studies and Science instruction are grounded in real-world, experiential learning. The Lower School uses Mystery Science to engage and inspire a young person’s scientific thinking and curiosity. Our goal is to engage students in investigating and making sense of the complexity and wonder of the world they will one day lead. It is a common to see students building weather stations, while reading Cloudy With a Chance of Meatballs, or building flying machines while learning about the basics of aerodynamics. Reading about the California Gold Rush can be an abstract historical idea, but historical learning, partnered with an overnight field trip to California Gold Country, and integrated with a geology unit, creates a dynamic platform to better understand our socially and environmentally complex state. 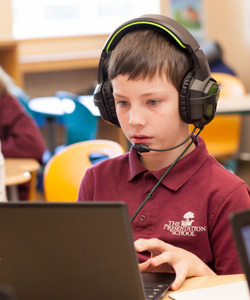 The goal of the Lower School Spanish program is to develop in students a love of language and a comfort and willingness to engage in conversation in a second language. All students, K-8, participate in three Spanish sessions per week. Learning in context, automatic linguistic recall, and vocal experimentation based on rhythm and melody memory are all primary attributes of a first language learning experience. Using a “Natural Acquisition Method,” students learn through songs, games, and learning activities, and incrementally gain in sophistication and core knowledge. In a natural acquisition scenario, students may not fully realize they are “learning.” Rather, kids naturally experience the language, and over time, increase their comprehension and expression. K-2 Classrooms have class sets of iPads. Student-friendly and tactile, tablets are the perfect device to reinforce spelling, letter writing, and individualized math practice, or to just explore the world beyond the classroom. As students grow in maturity and the ability to apply more complex tools, a 1:1 Chromebook program accompanies instruction in grades 3-8. Our K-2 students gather and reflect during weekly Chapel, when students and teachers come together in celebration of God’s love at work in themselves and each other. 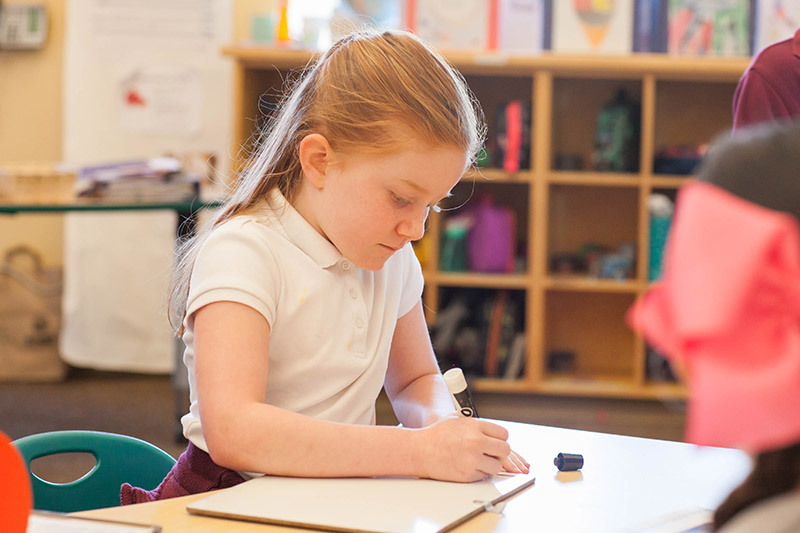 Lower School students take part in planning and leading liturgies, based on monthly gospel themes and service-learning opportunities. Rigorous and real world curriculum is the cornerstone of a Presentation education. Presentation offers an unparalleled scope of field experiences that connect directly to rigorous grade-level instruction. 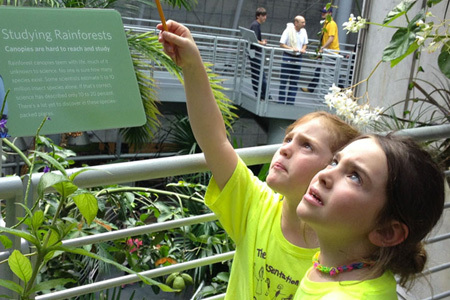 Lower School field trip experiences are a natural extension of an interactive curriculum, designed to help young learners grow in their ability to make connections between what they are studying in the classroom and the wider world. The kindergarten reads the Polar Express in their Language Arts class, but also experience Sonoma’s Train Town in new and novel ways. The kinders are introduced to the combustion engine as well as the Christmas magic of belief and hope. First graders become ornithologists with their year-long study of birds, drawing upon our own bird-rich campus grounds, guest educators and a bird watching field trip. With their families, our young scientists participate in the National Audubon Christmas Bird Count. Human flight is explored further at the Hiller Aviation Museum and the Chabot Space and Science Center. Second graders participate with the Sonoma Ecology Center in a month long study of our local oak and chaparral forests and meadows. The study of mammals and the oceans are completed with a visits to Safari West and the SF Aquarium. Students also explore the music of a symphony and travel to San Francisco to experience the San Francisco Symphony up close. Third grade take advantage of the San Francisco’s Exploratorium and the Natural History Museum in their study of the world’s and Bay Area’s unique ecosystems. The Fourth Grade reconnect with the Sonoma Ecology Center to dive deeper into ecosystems that make up Sonoma County. Students study master painters and sculptors before visiting the Legion of Honor in San Francisco. Students end their year of studying the history of California with an overnight adventure to Coloma, where they see up close and personal the gold country, where they learn first hand what Gold Fever means and how to pan for it themselves.